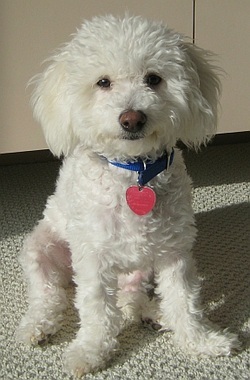 Our dog, Lily, is a Bichon Poodle that we adopted from a rescue agency when she was 4 months old. She had been in a puppy mill the first part of her life and was just coming “alive” for us by being a genuine curious puppy!! We went to puppy classes before she was 6 months old but still had some issues at 7mo. We found that Beth Duman’s positive training techniques were a godsend! Lily was 90% housetrained but the other 10% was driving my husband and I crazy. Beth mentioned that her signs might indicate a urinary tract infection. I collected a sample and sure enough, she did. After the first time Beth came to our house and spent two hours with us, Lily was a different dog. She was much calmer and less afraid of my husband. Beth worked with us to introduce my daughter’s much larger dog to Lily and that was very helpful too. We know how to manage the two dogs together successfully now. Beth pointed out to us how smart Lily is and gave us lots of ideas and exercises to use with her. I am happy to recommend Beth Duman to others who might be interested in focused and effective dog handling techniques. I took a 100-pound "used" dog into my home, a year ago, and with Beth's guidance, he is now the joy of my life! When he first came, he was reluctant to be touched on the head, feet and anywhere else he decided "I'd rather you didn't." Now, he's still, as he enjoys an all-over massage! 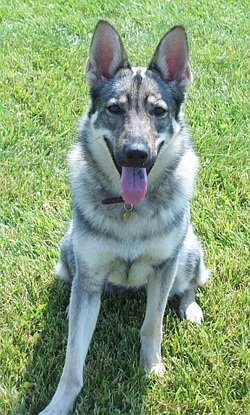 His breeder originally placed him, as a puppy, in an Ohio home. 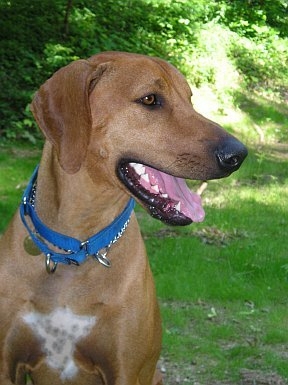 I had developed "tunnel vision" and dearly wanted a Rhodesian Ridgeback, and when given the opportunity, I lunged. I was immediately told to be sure I hired a trainer with experience with this breed. Well, Beth owns an African village dog, and her brain works similarly, Beth and I see many similarities in the two dogs. Such "familiarity" with a dog of similar origins, allowed a heightening of my comfort level. I am constantly impressed with her adherence to "positive" training. My other dog is elderly, and 14 yrs ago, everyone touted "dominance" training. I can offer testimonial of such training, and it's lack of effectiveness, with my old guy. Beth has been most helpful during any "glitches" that arise, or, to be more specific, just how to modify his behavior the few times he's clowned. Then, since I have some balance issues, which have greatly improved since walking him, Beth has been helping me train him as a Service dog. It's surprised me how well he's doing - I now feel confident taking him into restaurants and stores, but I think he will always be a work in progress, as I continue to be amazed at his constant progress. He "loves" Beth, and is always blissful around her. It's a godsend that she responded to my initial email, and is such a gifted and wise trainer. 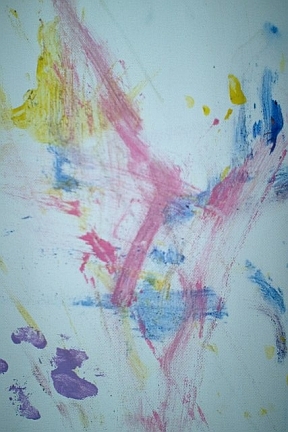 Yes, Sydney really did learn to paint. Sydney hated to have his paws touched at first but learned to wear a "Paintin Paw" to produce the masterpiece on the right. 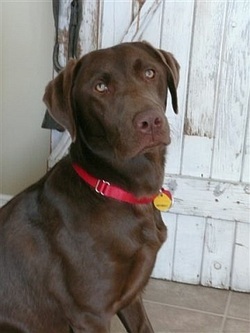 We have participated with Beth Duman in training Gracie, our chocolate lab puppy, as she has grown into a beautiful and well-behaved ten month old dog. Although Gracie is still young, we have been impressed with her development and very pleased with her obedience. She is just what we had hoped for. Because of that, I would highly recommend Beth Duman as a certified pet dog trainer and consultant. Her typical and private two hour in home sessions are well worth her modest fee. I attribute most of our success to Beth’s understanding of dogs and her willingness to work with us whenever we needed her. At all times, she has presented a no-nonsense, calm thinking approach to dog training. She recognizes and respects the process of both dog and owner training. 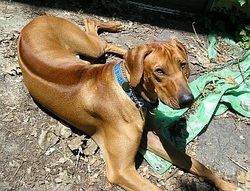 The results are evident, as we have seen in our dog as well as others she has trained. At our first meeting, before hellos could be exchanged, Gracie met her with frantic jumping, mouthing – in general, puppy bedlam. Beth remained quiet, ignoring her new and obnoxious student. The minute Gracie stopped, there was a quick and positive “yes” from Beth – and a small treat. Our pup took notice. It was a scene to relish – an unruly puppy realizing in mere seconds that good behavior is rewarded! That was lesson number one – and our introduction to Beth Duman. Since then, I have watched this process many times. Now, when there is a new trick or behavior, Gracie is a willing participant. I see my dog figuring it out, “what do I do?” Yes, she’s thinking! Gracie wants to please – and life is good! Beth has brought that to us – the joy of having a well behaved dog - the fun of doing it right! When Beth is working with Gracie, she is constantly observing her student – she stays on target, remaining vigilant, all the while making suggestions or answering my questions. And, although she remains focused on the dog’s behavior, she knows and stresses the importance of a good dog-owner relationship. To that end, she emphasizes a win-win companionship, where mutual enjoyment is key. After all, we are dealing with “man’s best friend.” That responsibility is not taken lightly. Beth’s background in biology and teaching lends itself beautifully to this end… as does her love of animals and the environment. Her positive approach does not just rest with the dogs – but also with their owners. She does not criticize, instead offering suggestions for all ages. We are indeed fortunate to have this talented and willing teacher serve as a guide into a more rewarding relationship with our dogs. I brought Emmy home on July 15, 2008 when she was about eight months old. By this time, Emmy had already spent an unknown amount of time learning how to survive on the streets, almost lost her life (twice) in two high-kill shelters, and given some "down-time" at a foster home to recuperate. She was thin, afraid of noise, terrified of people, didn't know how to play with toys, unruly on a leash, and had no apparent basic training. At that time, I didn't realize that I had brought into my life a very special dog who, after a year's work, would become my constant companion, protector and friend. In order to transform Emmy, and instill into her that she could trust me, it required that I give Emmy my attention, understanding and love. I needed to learn how I could become a better dog owner so that Emmy could demonstrate her innate good qualities. Beth helped me to realize that a "good" dog translated into a "good" dog owner. For this to happen, it demands that the dog knows that her owner is compassionate, but also cognizant of her actions and is in complete control. Emmy needed to know that I will reward her for what she has done well...not unlike how one would treat a child, or how we like to be treated, and that I will do so with kindness and positive feedback rather than with punishment. Emmy is my "wild card" dog, but I have learned to accept this as part of her personality. I have learned to anticipate these behaviors in order to curtail them before they become a problem. I have learned how to remain calm so that Emmy will remain calm as well. Emmy has, with the care and guidance of Beth, become a dog that I can truly love and, for this, I give Beth my deepest gratitude. 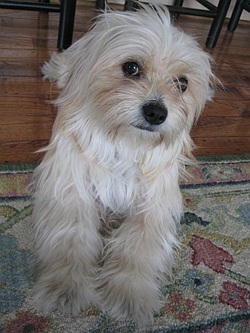 Our dog Oliver is a 1 1/2 year-old ShihTzu-Poodle mix. We took him to regular dog training classes because we are hoping to get him certified as a therapy dog. He was polite but a little reluctant and somewhat intimidated by the other big dogs that were less well-behaved. We heard about Beth through a pet store in Howell. We arranged to have her come to the house to train Oliver. She introduced us to clicker training. Oliver loves the training and Beth! He is turning into a little circus dog with all the tricks he is learning. He even makes up his own tricks. He loves to train and begs to do more when we stop. Auntie Beth's tuna cookies are his very favorite rewards. Beth is amazing. She works so well with Oliver and can get him to do things that we have struggled with all week. We now just say, "Wait until Beth gets here." She is patient, skilled and enthusiastic. We have sent several of our friends to her and will continue to do so. She is so in tune with what dogs really need and want! We are very sure Oliver will make a wonderful therapy dog under Beth's tutelage. More important, we will have a wonderful, happy, well-adjusted dog for a very long time. 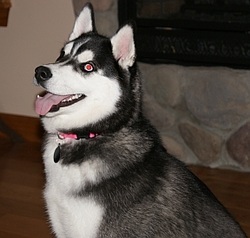 My name is Kiah and I am a Siberian husky. My Mom and Dad decided it was time to get another Siberian because it had been so long since one of us was around. Little did they know what they were getting themselves into! I was the runt of the litter and I had to fight my way for everything when I was with my siblings. We now play games such as "Can I Touch You" (yes!) which has taught me to trust people touching me. I have also learned that human skin is very sensitive to biting down too hard. I am a husky so I like to run and I am stubborn about coming back when I am called so Beth has taught my Mom and Dad to never count on me to listen when I am free. I only require short amounts of time for training during the day but I have to be consistent with it because I tend to revert back to my old ways. I had been through all the classes from puppy to intermediate to advanced and did graduate but still had issues. I had taken over the house and tried my best to do whatever I wanted and when I wanted. That's when Beth came into our lives. Beth is a wonderful trainer for my humans. She taught them how to handle me and do it in a nice way. I never felt threatened and started to see that I should be better to my Mom and Dad and do as they asked. You see, I am very smart and want to stay the way I am with what Beth taught me. Thank you, Beth, for all the training and being so patient with me.